Throughout human history, door locks have been used as the basis of security systems with a primary function of restricting use/access of certain spaces from unwanted users. These lock systems have seen many enhancements and changes over the centuries and have shaped the foundation of modern security systems today. The origins of door locks can be traced back as far as 4000 B.C., where evidence was found by archaeologists in Egypt, Greece, and Iraq. These locks shared the same basic principle of pin locks today where pins of varying length prevented access to the door unless the matching key was inserted to line up the pins and access the door. 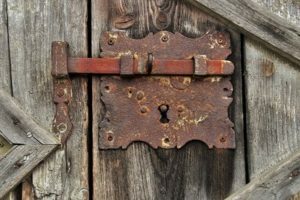 Basic wooden locks were used in this period however, they were not very durable and could be easily broken with enough force. Consequently, the Romans improved upon the design of these locks by making use of metal components for increased reliability and security. The Romans would wear their keys in the forms of necklaces, pendants, rings etc. as a symbol of wealth to show people that they owned something worth safekeeping. People quickly began learning how to manipulate these locks and gain access to them without possessing the correct key through lock picking techniques. This created a problem for lock makers throughout history. Advancements in banking systems, as well as the use of monetary currencies within the medieval ages, created a need for more robust door locking systems. This led the English to create the first full metal warded locks. These made use of a cylindrical design that prevented the key from turning unless the pattern of the key matched the internal plates of the lock mechanism. However, these types of locks had one major flaw. One could bypass this lock by filing down the key’s notches and avoid the cylindrical plates within the locks entirely. This gave rise to the term “Skeleton Key” where all-purpose keys were being created to bypass these lock systems. As a result, the security of these locks was compromised as some individuals were able to gain access to many different locks relatively easily using skeleton keys. The industrial revolution was a period of rapid innovation and technological advancements. This brought upon many innovations and improvements within the security industry as well as door lock technology. The beginning of this series of innovations took place in 1778 when Robert Barron created a lock that required the internal lock pins to be lifted to specific varying heights to disengage the lock mechanism. Although this type of lock was more secure, with the right tools and skills it could still be picked. Thus, in 1784 a new lock was created by Joseph Bramah that is still seen and used today. This lock remained unpicked until 1851 where an American locksmith known as Alfred C. Hobbs was able to crack it. In the search for an uncrackable lock, the British government held a competition for the invention of a lock that could not be opened without the correct key. Jeremiah Chubb won the competition by creating a lock that improved on Bramah’s design by creating a self-jamming feature in the event of the insertion of an incorrect key. The lock was thought to be uncrackable until once again, Hobbs was able to pick the lock at the Great Exhibition. Advancements in digital and computer technology brought with it many new possibilities and improvements in door locking systems. In addition, the ever-growing needs of security, privacy, and safety in modern society have resulted in new door lock innovations that integrate the concept of traditional lock systems with digital technologies. Some of these new lock technologies include biometric scanners, thumbprint recognition, PIN codes etc. One major difference between these new digital locks and their historic counterparts is the ability to unlock them without the use of a physical key. This reduces the risk of users losing the key and being unable to access the lock. Although these modern digital locks offer many security benefits over their traditional counterparts, they are still vulnerable to cyber invasion techniques known as hacking. Thus, digital lock systems are constantly evolving and becoming more robust to reduce the threat of unwanted access to these systems. Many digital lock systems can be expensive so many people today still make use of physical key-based locks or combination locks. Their familiarity, accessibility, and ease of use make them ideal choices. Door locks have seen many incremental changes and advancements throughout history however their fundamental principle of keeping out unwanted users has always remained constant. Today locks are integrated throughout modern civilization, from cell phone lock screens to bank vault doors. While their use in historic times may have been simple, their application within the modern world is endless.